After you watch Australian director Gillian Armstrong’s gorgeous period film Death Defying Acts, which surrounds an unlikely love story set in Scotland among a phony psychic con artist (Oscar winner Catherine Zeta-Jones) and Harry Houdini (Memento’s Guy Pearce), you’re left wanting to learn more about the legendary “escapologist.” However, after you listen to the film’s score, you become fascinated by an altogether different magician — not Houdini, but the imaginative composer Cezary Skubiszewski instead. Born and raised in Warsaw “in the midst of an arts and theatre focused family,” consisting of his pianist mother, prima ballerina aunt, and theatre manager father, Skubiszeweski still recalls the moment that the sound of the blues “blew his mind” at age twelve. Yet “it would take another 20 years, and the death of his father, before Skubiszewski was true to his own desire to make music.” After leaving Poland for his adopted homeland of Australia and studying veterinary medicine in Melbourne, he journeyed to the outback in New South Wales, packing a precious few items including a piano which he practiced all the time while living in an army tent. Working only one day a week to support himself and slowly gaining the self-belief he said one must have “to be a creative person,” Skubiszewski notes that it was about that time that he became much more serious about dedicating himself to music. While he credits inspiration in a wide range of sources from Miles Davis to American Beauty composer Thomas Newman to Radiohead (“because they always try to challenge themselves,”), Skubiszewski takes a similar approach in his own work, saying that he still believes he’s on “a journey to discover more about myself, about what I can come up with.” To this end, he should be extremely pleased with one of the most breathtaking and creative scores of 2008 with the Lakeshore Records release of Death Defying Acts. As someone who notes that he loves “very talented people” and “despise[s] mediocrity,” it’s only fitting that director Armstrong (Little Women, Oscar and Lucinda, Charlotte Gray) would seek out a talented perfectionist to tackle a score about one of history’s most talented perfectionists. 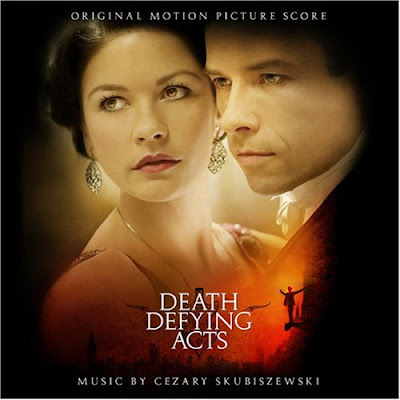 Boldly opening with an old-fashioned “Death Defying Suite,” which introduces every major theme that will work its way throughout the entire score, including those for the lead characters and diverse settings, Skubiszewski begins the album as though it was recorded in the era of Hollywood’s Golden Age where MGM musicals began with extended musical overtures and credit sequences to showcase the compositions. Running nearly eight minutes and changing from a playful folk styled opening to melancholy, romantic, and Celtic throughout, the album continues on, later picking up on the threads he’d introduced in the opener with the tracks named for two of the characters in the film. In “The Great Houdini,” he relies on a mysterious string-based start to a piece that many critics have noted seems to augment Houdini’s Jewish ancestry, thus “mixing in klezmer style… to heighten character.” In one of the most colorful and inventive tracks on the album, we’re introduced to Zeta-Jones’s stage character "Princess Kali" — a psychic who works in tandem with her daughter (played by Atonement Oscar nominee Saorise Ronan) — in tricking her audience with psychic visions. Using a flute and employing an Eastern based Egyptian and Indian blend of folk, it’s both seductive and tongue-in-cheek at the same time as Zeta-Jones works the audience with her obvious beauty and the great ease with which she falls into character and the music helps us buy right into her act right along with the audience. Skubiszewski returns to the teasing motif he introduced within the opening seconds of “Death Defying Suite,” with the Danny Elfman-esque “Hello Edinburgh,” announcs Houdini’s arrival to Scotland and we can practically envision the stampede of eager fans, newspapermen, and photographers in this catchy, fast-paced track. It alternates between strings and a chorus chanting breathy “ahs” that punctuate each pluck of the string in building anticipation. And a few tracks later, the characters coincide as Zeta-Jones’s Mary answers Houdini’s $10,000 challenge to channel his deceased mother in the afterlife, in “The Audition.” Fighting the urge to be sentimental as we see the way Houdini is bombarded by fortune-hunters, Skubiszewski heightens the ridiculousness of the situation in which the otherwise rational Houdini who adamantly disbelieves in the idea of a medium still wishes to be proven wrong as an overgrown boy who misses his mother. Musically, it works quite well. The silly exuberance of “The Audition” gives way to the lush, melancholic tones of “You’re the One,” that begins to introduce the mysterious connection between the two characters whose business agreement blossoms into a romance, yet one that’s still tinged with precaution and apprehension. It finishes abruptly, as though in the middle of an incomplete question. Using the 1926 backdrop to perfect effect in “Maid Does The Dishes,” Skubiszewski mimics the musical styling of the era in a ballroom worthy track to which you can easily dance. The romance between the two leads culminates in the delicate piano laced number “Just Like Falling,” as the escapologist realizes that he’s unable to escape as a man from the lure of the beguiling possibility of true love. However, just when it starts to border on too sentimental, Skubiszewski brings back the same vocal chorus from “Hello Edinburgh” and with a few somber notes, seems to foreshadow the end of Houdini’s life which would ultimately conclude the film’s events. Paying homage both to the romance of the visually stunning picture as well as the Celtic backdrop, Skubiszewski follows up “Just Like Falling” with the extremely Scottish, lovely “You Saved Me.” Although the film, from The Weinstein Company and Genius Products failed to gain much notoriety in its theatrical run and indeed, failed to open in my home state so I had to wait for it to appear on DVD, Skubiszewski’s score elevates Armstrong’s work into a miniature epic. And given the film’s poor timing following Neil Burger’s exceptional The Illusionist and Christopher Nolan’s dark puzzler The Prestige, it may be easy to overlook a third magical film. However, if I were Skubiszewski’s agent or working for The Weinstein Company, I wouldn’t hesitate to send this soundtrack to as many Academy voters whose addresses I could find. Moving, unique, endlessly unpredictable and artistic — Skubiszewski’s score has pulled off a musical trick of rare beauty worthy of Houdini himself. 5. "The Star Picture House"
15. "Maid Does The Dishes"